This recipe was originally submitted in 2008. After getting many rave reviews from site visitors, I thought it was about time I tried it for myself (February 2013). I'm sad to report that I was underwhelmed by this recipe. For a granola with no oil or butter, it's alright as a cereal with milk. I wouldn't recommend it as a dry snack. Despite some of the user comments, I personally thought it needed every bit of the honey listed and then some. 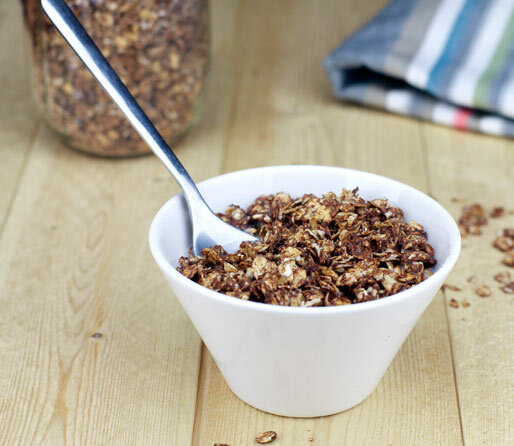 If you don't mind just a little butter, I would strongly suggest that you use this recipe instead: Chocolate Granola. 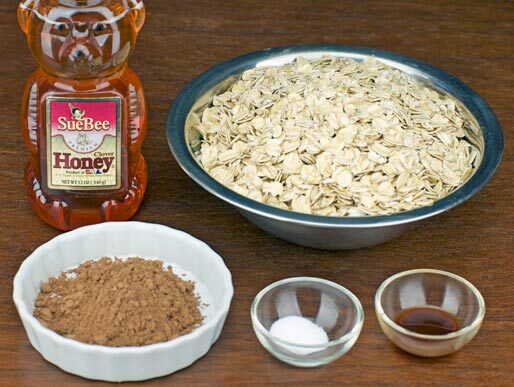 In a large mixing bowl, combine all of the ingredients until all of the oats are moist and the mixture looks even. Spread the mixture evenly over a large cookie sheet or two smaller cookie sheets. Bake in the center of the oven for 30 minutes, stirring the granola every 5 to 10 minutes. Remove from oven. Optional: At this point when the granola is still warm, you can mix in extra ingredients like a 1/4 cup of raisins or other dried fruit. Let the granola cool completely before serving or storing. Optional: When the granola is completely cool, you could stir in 1/4 cup of mini chocolate chips for Double Cocoa Granola. Just make sure the cereal is cool or you end up with a melty mess. Trust me. Store well for 3 weeks in an air-tight container. This is a nice granola to have as a cereal with milk. 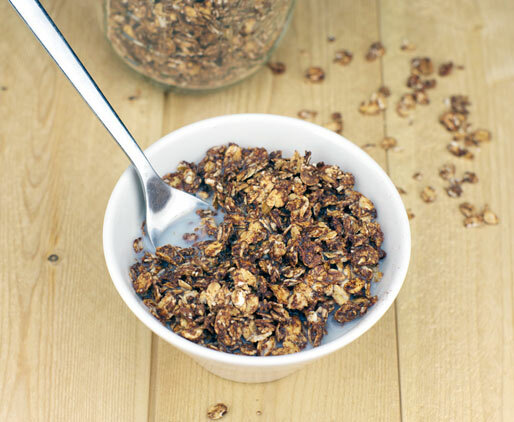 Try adding mini chocolate chips at at the end to make Double Cocoa Granola. Recipe number 2350. Submitted 7/8/2008.